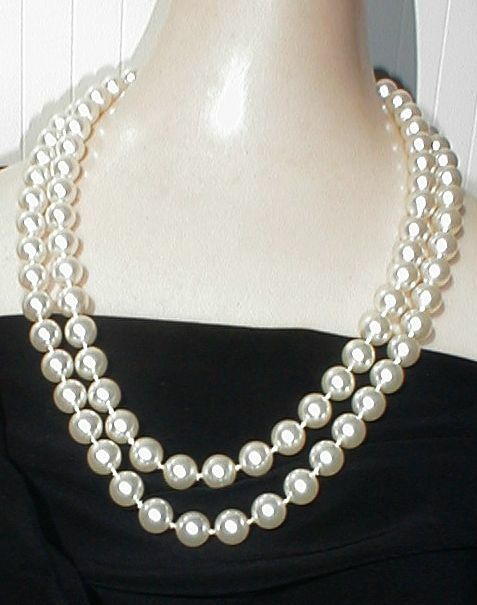 Fun length and nice size simulated pearls offer lots of variations in wear. Soft shimmering white simulated pearls are lightweight and knotted. 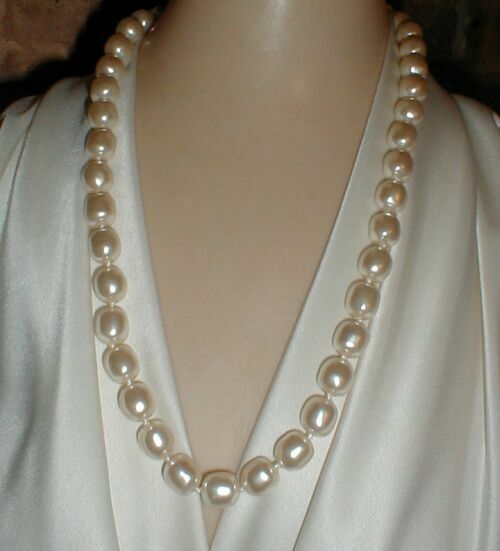 A pearl-covered push-in clasp allows opening to drape twice around the neck. Note Size: 39" L. Sim. Pearls: 9 mm. 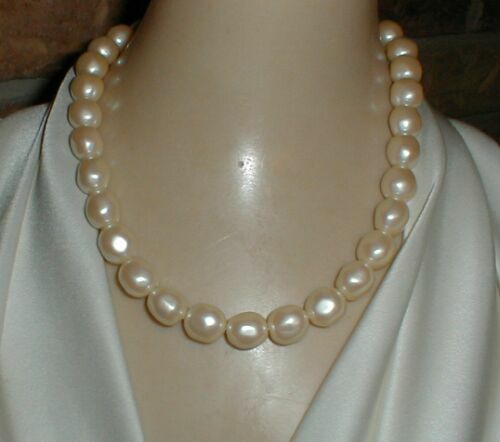 Let them see you arrive in this super-sized simulated pearl necklace. Soft white knotted beads. Wear three times around your neck as shown, or just twice as shown here. 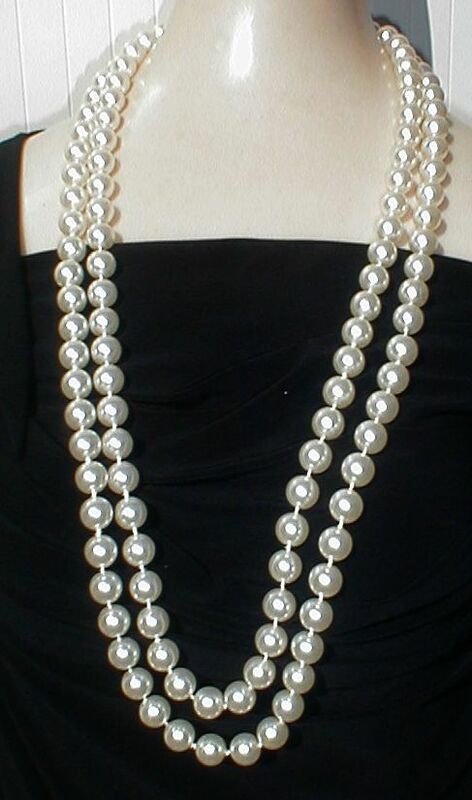 Note Size: 70" L. S. Pearls: 10 mm. No clasp. Good medium length rope with soft white knotted beads. 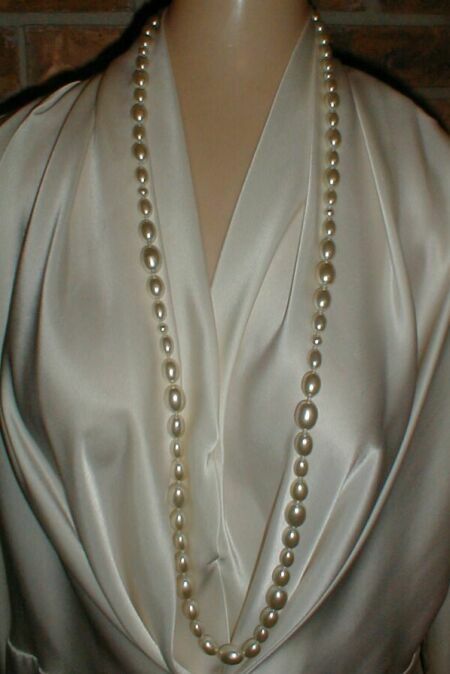 Easily drapes twice around your neck as shown, or wear full length as shown here. 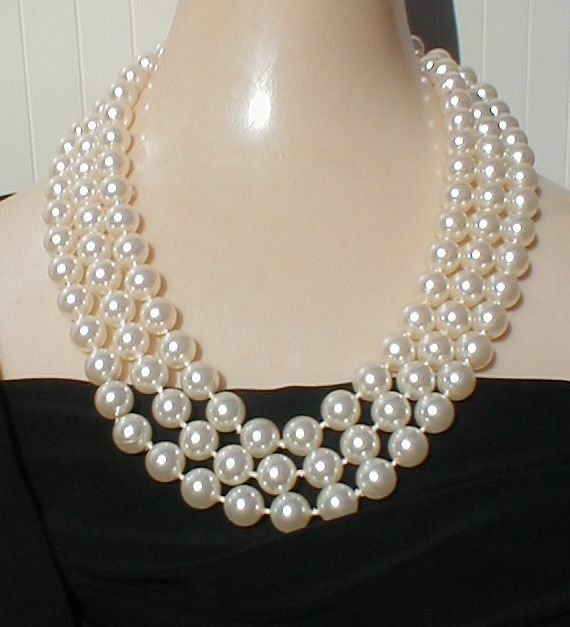 Note Size: 50" L. S. Pearls: 10 mm. No clasp. Perfect medium length to wear as shown or doubled. Warm golden beige baroque beads. 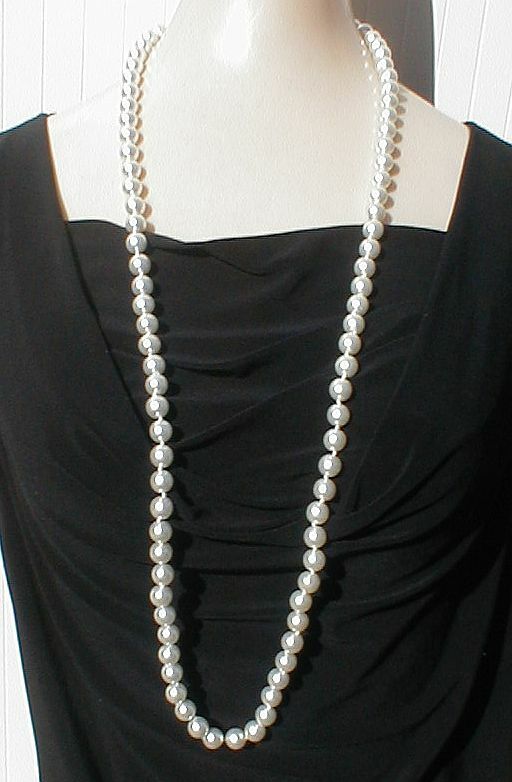 Size: 36" L. S. Pearls: 9 mm approx. Spring ring clasp. 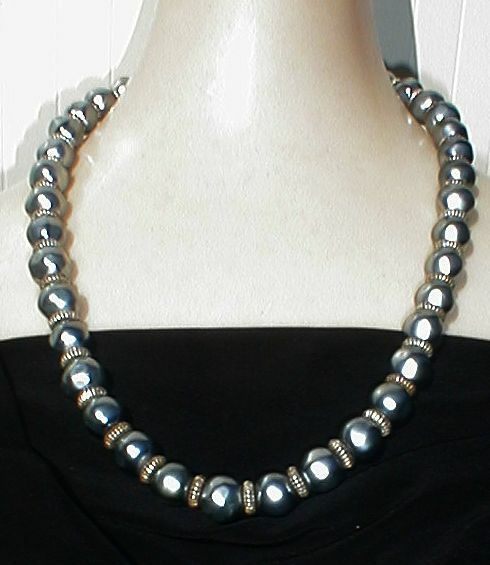 Shimmering deep gray baroque s. pearls are accented with ridged goldplated spacers for a very rich look. 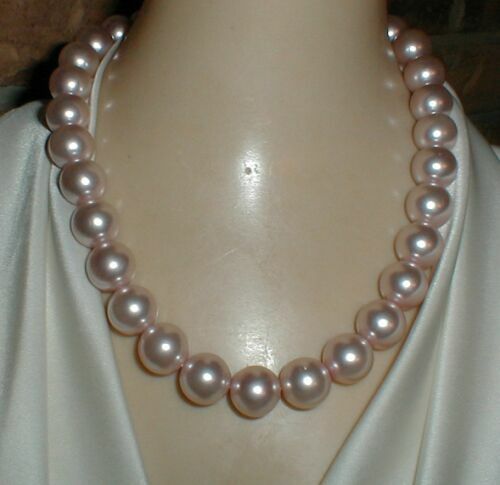 Size: 24" L. S. Pearls: 12 mm approx. Barrel clasp. A classic and always correct and elegant choker that no pearl wardrobe should be without. Organic shape baroque 13 mm simulated pearls in a warm ivory shimmering shade. Springring closure. Size: 18" L + clasp. A dressy length, ready to add to the office blouse for an after-work event. 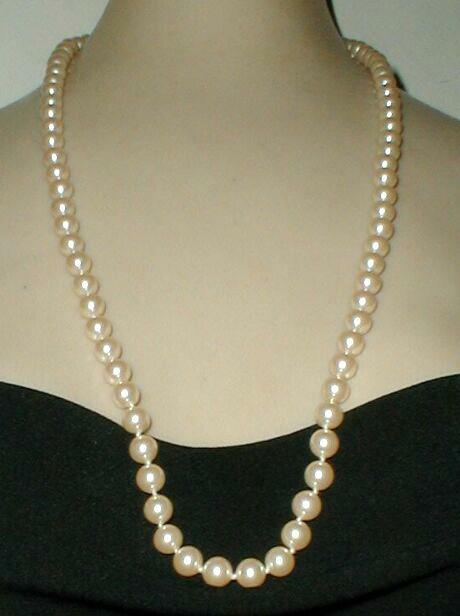 Organic shape baroque 12 mm simulated pearls in a glossy pearl shade. Springring closure. Size: 24" L + clasp. When white pearls won't do it, reach for pink. Perfect pink spheres of simulated pearls light up any neckline. Springring closure. Size: 18" L + clasp, Sim. 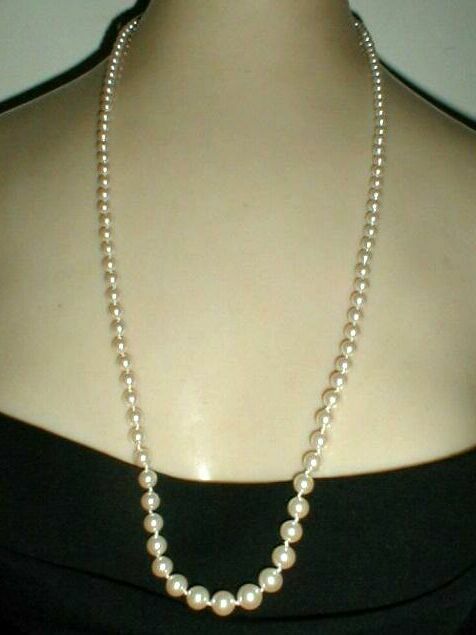 pearls: 12-13 mm approx..
8 mm simulated pearls strand, glass, knotted, spring ring clasp. A very creative treatment is shown in the mixture of different sizes shimmering white oval simulated pearls. 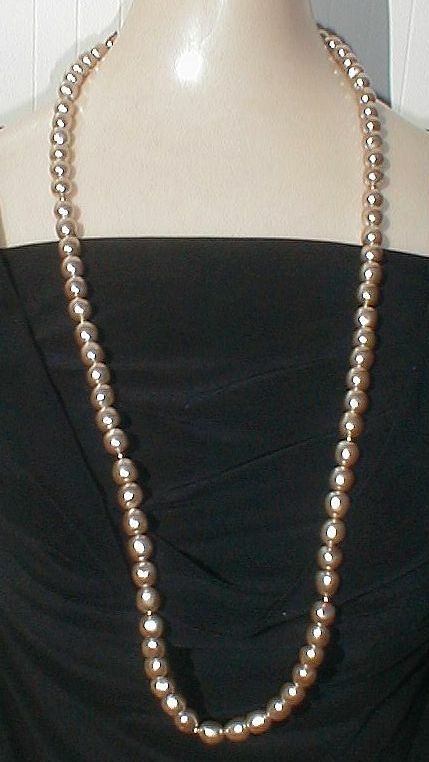 Knotted, with a round simulated pearl invisible push-in clasp permits wearing doubled. Size: 40" L , Sim. pearls: 10 to 13 mm long, approx. Graduated simulated pearl strand, glass, knotted, spring ring clasp.